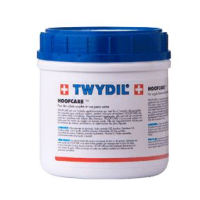 Twydil Hoof Care encourages the accelerated growth of strong hooves and healthy, supple skin. This brilliant formula can be used to treat dry, cracking hooves as well as saddle sores and other skin irritations. To apply, first ensure the hooves are clean and free from any foreign objects. Then, massage a small amount of Twydil Hoof Care into the hoof wall, hard sole, frog and the coronet band of each hoof.